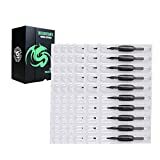 Dragonhawk 60pcs tattoo tubes with Pre-sterilized needles. 1.This tattoo needles with disposable tubes is made of high-quality material, it is durable. 2.Professional standard length loop bars suitable for all tattoo machines,tattoo supplies. 3.This tattoo needles and tubes combo is lightweight and easy to carry. 4.With an anti-slip handle,it is carefully designed and excellent for use. 5.Individual blister package can protect you from virus infection. This entry was posted on Saturday, January 26th, 2019 at 1:35 am	and is filed under Tattoo42. You can follow any responses to this entry through the RSS 2.0 feed. Responses are currently closed, but you can trackback from your own site.